Criteria: 2006 Rock and Roll Hall Of Fame Inductees. Names are in alphabetical order. A small and somewhat mediocre overall class highlighted by two previously overlooked candidates, an ill-fitting jazz legend and one of the more notorious acts of all-time to grab the requisite headlines for this year's ceremonies. Unfortunately the failure of numerous deserving candidates to get enough votes, along with the shameful dearth of black artists, including what would've been the inaugural hip-hop act, raises more touchy questions for the Hall voters to have to defend. While the Hall has corrected some previously shameful oversights in Sabbath and, to a lesser extent, Skynyrd, and didn't enshrine any totally underserving artists, as has happened in the past, it somehow still failed to do a very credible job overall. The largest ongoing problem continues to be their undefined scope of just what areas of music the Hall of Fame is focused on, allowing voters to use differing, and thus intentionally vague, measurements in their selections. Further compounding their troubles is their voting bloc's ongoing lack of respect for certain notable areas of rock 'n' roll that they seem perennially out of touch with, or worse yet, totally unfamiliar with. This has included everything from early-50's pre-integrated rock 'n' roll, to heavy metal, instrumental rock, progressive and disco, but in recent years has been increasingly negligent of black styles of rock, something that only seems likely to increase as time goes on unless rap begins to be given their just due as more of its artists become eligible. The Hall's first decade of existence had no such overwhelming cultural bias evident and saw inductees from most all backgrounds and styles of rock 'n' roll, as might be expected since far more of it had appeared on the all-inclusive AM airwaves that dominated those eras, allowing all of the music equal exposure to a generous cross-section of listeners, voters included. But since artists from the 70's first became eligible ten years ago, this trend of omitting qualified candidates has disproportionately hit black artists, perhaps the result of FM radio's enduringly racist playlists that have skewed attention to white guitar based artists since that time at the expense of all others. The predominatly white male voters reflect this narrow and myopic view of rock in their choices this year. Notably three of the most qualified candidates on this year's ballot that were inexplicably left out were black. Soul and funk legend, Joe Tex, he of 28 U.S. Pop Chart hits (or ten more hits than the combined total of ALL of this year's inductees! ), disco superstars Chic, who in addition to defining a sound and era as performers also produced numerous hits for others, and rap pioneers Grandmaster Flash & The Furious Five, who's lack of necessary votes last year raised serious and widely debated questions about the Hall voters competency and racial tolerance. Now to be fair, multiple time nominee John Mellencamp, who was by far the most prolific hit maker of this year's class of candidates (10 Top Ten hits), has failed to get enough votes yet again, so it's not all simply race-based ignorance, but one look at this year's selections raises far more questions as to the Hall and its voting body's agenda and qualifications than it answered. Long deserving metal pioneers finally broke through, undoubtedly thanks in part to Ozzy Osbourne's recent transformation to loveable pop culture icon. Of course, the question has to be raised as to what actually changed about their accomplishments, which were just as worthy in 1995 when they were first eligible, something the Hall voters have consistently proved incapable of answering. 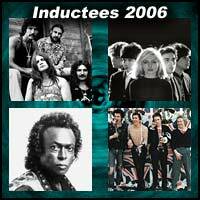 What may wind up being the most notable facet of their induction is in opening the door for other metal artists to make it, one of a numerous stylistic areas the Hall has been reluctant to bestow the honor upon thus far. They had the requisite big hits (an impressive four #1's), as well as the female lead that the Hall seems to likes in order to ensure induction night gender equality if at all possible, all of which was enough to give this deserving group the nod. Their induction also bodes well for the new wave movement that is just now reaching their eligibility requirements which should ensure that this style of rock doesn't get wrongly overlooked. Debbie Harry's presence at the ceremony might also provide a verbal kick in the pants for rap's future with the voters, as she was a prominent advocate of hip-hop's early crossover appeal. An unquestioned legend, but in a different field entirely, which makes his induction somewhat out of place in a Rock 'n' Roll Hall Of Fame. Technically his jazz fusion work of the early 70's gives him a rock pedigree of sorts, and comparisons could be made to many pure blues artists such as B.B. King or Muddy Waters, as well as country stars Johnny Cash and Brenda Lee, who themselves had only tenuous connections to rock 'n' roll. But overall this seems like a typical Hall Of Fame reach for a well-known "name", either for reasons of voting ignorance as to just what is being honored, or to draw in a broader audience for the televised ceremony that increasingly relies on (and relentlessly promotes) star power. The second artist of this year's class who's had to wait too long as it is, Skynyrd's reasons for exclusions were never as clear cut as Sabbath's, but the result was the same. With most of the biggest names of the 50's and 60's already in, and each year of the 70's now eligible, it appears that the second tier of solidly consistent, but not quite superstar, acts of that decade will be filing in over the next few years, something that began with Bob Seger last year and continues with Skynyrd this year. They are worthy of induction, but apparently were not worthy enough to get in as soon as others from their era. This year's headline grabbers, next to Sabbath, for their notorious image that has long towered over their rather minimal output. That huge name recognition apparently gave them the edge over the equally qualified Stooges from the same basic genre, and as usual, the voters are blinded by familiarity. Not unworthy of induction, thanks to their legendary groundbreaking album and first singles and subsequent influence, but considering this year's exclusions with far greater overall bodies of work, their induction only reinforces the Hall's pandering to a narrower and more predictable audience. Well regarded duo in music overall, but with only a very slim connection to rock music. Alpert got his start hanging around Sam Cooke, writing "Wonderful World" in fact, and later produced the earliest Jan and Dean records, but while he struck big as an artist with the Tijuana Brass, they were the definition of Adult Contemporary, a style that got its start when traditional pop was overtaken by rock 'n' roll. But supposedly he's in here with Moss for their work in starting A&M Records, a label that too had very little connection to rock. Both are well liked and certainly successful in music overall, but not nearly qualified enough in the field of rock 'n' roll itself to merit induction here. This category has long been seen as nothing more than payoffs to widely respected industry men, regardless of actual credentials in this area, and unfortunately this selection only reinforces that perception.